Festivals in Malaysia are on another level culturally, historically and in the sheer number of them. Living in a multi-cultural country means that all religions and traditions are very much alive within the different ethnicities. Cheng Beng, also known as Qing Ming or Ching Ming, is a traditional Chinese festival and is basically All Souls Day. It’s one of the most important events on the Chinese calendar and was originally celebrated on the 104th day after the winter solstice to commemorate the mid-spring equinox. Back then, life was firmly regulated by the seasons. There were several other names given to this time, including the rather dire Festival for Tending Graves and Tomb Sweeping Day. It’s interesting to note that direct translation of ‘cheng beng’ is ‘clean and bright’. As with most ancient festivals, there’s always a good legend attached to it. In this case, the story begins a thousand years ago during the era of the Jin dynasty. The emperor’s son was falsely accused by a concubine of rebellion so that she could place her own son in a position of power. He had no choice but to flee to the mountains with a few loyal courtiers where hunger and hardship awaited. One of his men cut flesh from his own thigh (what’s a good legend without a bit of cannibalism?) to cook for the emperor’s son. He was so touched by this act and asked how he could be repaid. The answer was simple – be a good and just ruler. The concubine eventually died, and he became emperor but along the way forgot what it meant to be humble, causing the courtier to retreat into the mountains to live a life of seclusion. When summoned by the emperor, he refused the invitation and that didn’t go down well. Soldiers burned the area he was living in and he was found dead under a willow tree. Filled with remorse, the emperor declared a day of remembrance to show his penance. This year, Cheng Beng falls on 5 April, but many families tend to celebrate earlier as it’s acceptable to do it earlier rather than after the date. Contrary to what people may think, this isn’t a particularly mournful or sombre event. In fact, family members take it as an opportunity to get together and perform timeless rituals honouring family members who have passed on. Filial piety is such an integral part of Chinese culture and is diligently instilled into the younger generation; gatherings like these bring the point home. What actually happens during Cheng Beng? The day can begin early, sometimes at the crack of dawn to avoid the sun, when everyone gathers at the grave and the cleaning commences. And it’s not just about cleaning the actual tombstone, but also making sure the surrounds are tidy – so weeds are cleared, headstone inscriptions refreshed, incense burned and offerings provided. As not everyone is interred in the ground, columbariums (where urns are stored) are also visited. The most intriguing part of the process is the concept of ‘hell money’ and all sorts of necessary items made of paper that are burnt for the ancestors to use in the afterlife. It used to be that money was enough, but times are a-changing, as now you’ll find mobile devices (one may want to check FB in the hereafter), TVs, laptops, credit cards, designer handbags, fancy cars and even passports! 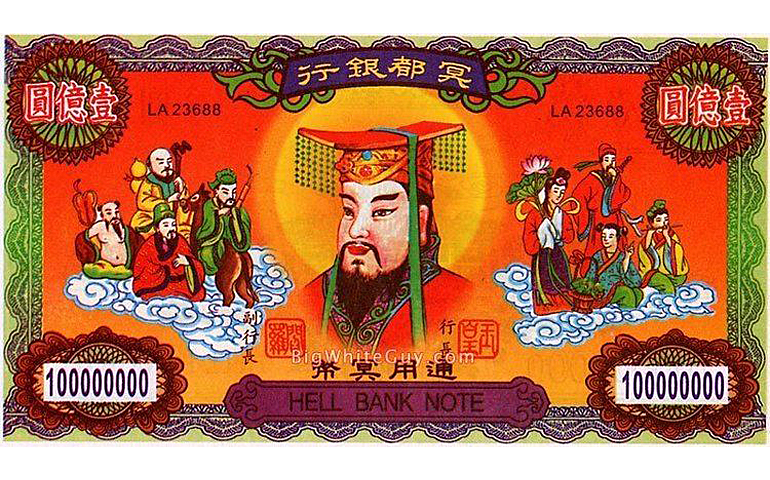 Hell money usually has the Jade Emperor’s likeness printed on it and is available in extraordinarily high denominations. Temples will be filled with altars overladen with fruit and food offerings (pink mee koo or ‘turtle’ buns are a staple) and the smoke of thousands of burning joss sticks. But beyond the burning and cleaning, Cheng Beng is a commemoration of family values and honouring those that came before us.